Across Asia, man-made structures have stood powerless to avert tragedy after tragedy during 2018’s rainy season. 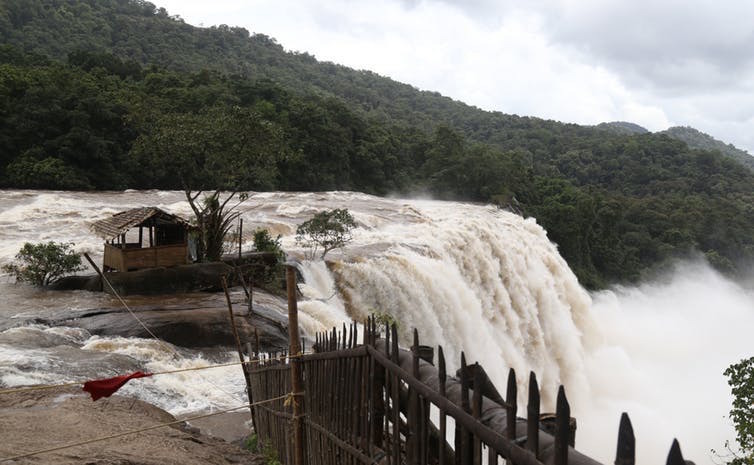 Hundreds remain missing in Laos following the collapse of the partially built Xe-Pian Xe-Namnoy hydroelectric dam, which followed relentless rainfall. Dams are vital for energy needs and economic growth. But they’ve been criticised for posing risks to local communities and the fragile environments in which they are built. In the case of both Laos and Kerala, questions are being raised about the long-term suitability and sustainability of dam building projects in the light of recent disasters and the continued threat of climate change. At the same time “green” infrastructure – a term for nature-based structures capturing stormwater underground and in wetlands – is gaining popularity. It was the topic of the United Nations’ 2018 World Water Development Report, which called for concerted efforts to feature natural infrastructure among the solutions when addressing increasing vulnerability and water insecurity. One example of a successful “green” infrastructure approach can be found in the town of Kitui in Kenya, situated 150 km east of Nairobi. The land in Kitui is semi-arid. Rain falls in two wet seasons, usually as infrequent, intensive storms. During the dry season, surface water sources are scarce. It takes a long time to walk to the few reliable water sources. In response to these challenges, and given the good geological conditions for constructing sand storage dams, the government has budgeted for 2,000 sand dams to be built by 2021. Sand dams are simple dams on seasonal smaller rivers that use naturally accumulated sand behind the dam wall to create a subsurface reservoir for water. Sand dams can store up to 10,000 cubic meters per year. The water these dams save can be abstracted throughout the dry season, avoiding problems found with standard dams such as evaporation losses, contamination from other sources and malaria. Thanks to this technique, the distance to drinking water sources in the dry season has declined by 1,700 meters, on average. In some cases it’s dropped from more than 10 kilometres to less than one. More water and soil moisture has become available for agriculture, increasing the irrigated crop area by 400%. Typically, the increase in income surpasses the construction and maintenance costs of sand dams. This makes them economically sustainable options, and the dams are now spreading to Burkina Faso, Ethiopia, Tanzania and Uganda, where seasonal river flow and a suitable subsurface renders them viable and sought after. Other natural infrastructure is hidden below the ground. Around half of the water we use for irrigation is found in underground aquifers. Finding ways to keep those aquifers fully charged helps communities to stay a step ahead of climate change. Water can be safely stored in times of excess, then made available again in times of scarcity. In India, the International Water Management Institute is piloting a project to divert monsoonal flows from irrigation canal systems into underground aquifers, via specially designed ponds. The project showed that each system is enough to store up to 70,000 cubic meters of water underground each year without any detrimental impact on the environment or groundwater quality. This amount of water enables local farmers to grow up to 35 hectares of crops in the winter season or 11 hectares in the dry season. Local villagers perceive that their water availability has improved for both domestic and agricultural uses, and the underground taming of floods approach has now been incorporated into the Rampur District development plan, opening the way for broader implementation. The Sri Lankan capital of Colombo is a city built on wetlands. This complex network of water bodies has the capacity to store enough water to fill 27,000 Olympic-size swimming pools, reducing the risk of flooding. It also helps reduce extreme temperatures across at least half of urban Colombo through evaporative cooling. Yet these wetlands are disappearing at an alarming rate. In some areas, as much as 60% of the wetland area has been lost since the 1980s. The current overall rate of loss due to urban expansion is estimated at 1.2% per year. Unless this trend is reversed, the wetland area will decline by one-third over the next two decades. Local institutions have responded with a comprehensive plan for better wetland management. This features 20 concrete action points. These include the formation of a wetlands committee to coordinate efforts and institutional contributions. Wetland benefits are also being incorporated into the government’s urban planning, ensuring this “green” infrastructure is protected. Recently, the Sri Lankan cabinet approved an order to halt all land reclamation and destruction in the wetlands, and declared the ecosystem a protected zone. Worldwide water crises show no signs of slowing. It is time we paid more attention to nature’s own engineering. At times, the best course may be to combine it intelligently with human invention. The time for relying solely on man-made infrastructure has past. We need to work with nature, if we are to temper its own extremes. Header Image: Heavy rainfall recently devastated large swathes of Kerala, India. Credit: Prakash Elamakkara/EPA.